When I was asked to write a blog on my love for Arsenal, the mind straight away goes to past tense quotes and thoughts. I still consider myself an Arsenal man, but what I loved about being a fan of the club is stuck in the past, so I’ll go over a few things which originally got me hooked on the club. My first match was Arsenal v Everton in the 1985-86 season at the age of eight, and I must confess that I went with a keen eye on the away team who were defending champions and title challengers. I had just got into football and I liked Everton because so many other people supported Liverpool in my school (which was just two miles from Highbury). Everton won the game 1-0 but I came away an Arsenal fan. Not because of the performance of Don Howe’s average team, because I can only recall one tame shot on goal from Viv Anderson. But I loved Highbury I wanted to go there again. It immediately felt like home. I loved the red and white kit and that the team badge was a cannon. In the following years I was lucky enough to be part of the last generation of kids to be able stand on the terraces at top level football. For a child, there was no better terrace than the West Stand lower junior gunners section which stretched from one end of the pitch to the other. Here you could walk from the North Bank side to the Clock end, so whatever half Arsenal were shooting at you’d change your position. It was a sense of freedom which just doesn’t exist anymore in the current era of sitting down and doing what you’re told. To get your spot for big games you had to get in the ground at least an hour early. To the modern fan that might not sound like a good thing to have to do, but it was great. For a London derby the atmosphere would start at 2pm between the home and away supporters. The players would come out to loud ovations for the warm ups. More than any other part of Highbury I loved the North Bank which was by far the best designed terrace ever. Show me a roof of a stand with as much style as that and I’ll show you a Spurs title win in colour. If you went into the middle or top side you’d experience a mosh pit reaction to whenever a goal was scored. I recall a goal in 1991 when Limpar scored the winner against Man City. In the wild celebrations, I looked above and there was a guy who had jumped so high he ended up crowd surfing. I know it sounds weird, but I loved and as well as hated – the away goal celebrations at the other end. Each conceded goal felt like a hammer blow, but the energy in the away end was breathtaking and a sea of people all going ballistic at the same time – it was an incredible sight. Today you don’t get anywhere near the same degree of chaos that greats a goal, either in the home or away end. It’s the lack of those elements that now keep some of us away. Why bother going to a sterile environment for such a high price, when you could watch it in the pub? People love choice and Arsenal years ago had options; the choice to sit down in a civilised environment, as well as the option to go mental in the Clock End and stick one to the away fans. I loved the Clock End. When the seats were forced upon us in the 1990s, that was the one part of Highbury which maintained a degree of atmosphere. The North Bank had gone quiet; the East and West stands always were quiet – but even with seats the Clock End remained a place where fans got behind the team. As far as the team goes I loved the fact that Arsenal became such a formidable force under George Graham. I was lucky. I started supporting us when we were average, then very shortly George Graham took over and immediately made us contenders. We would now take Everton’s place in challenging Liverpool. Wenger, before he lost the plot, did the same against Manchester United’s total dominance – his Arsenal early teams took them on when nobody else in the Premier League were up for the challenge. I loved the fact both these manager’s achieved success and made our club world class by having a good eye for talent and not having to spend more than anyone else (that’s not an endorsement of Wenger’s current stubbornness and eye for average players). George Graham’s title winning teams were built on bargain buys, team spirit and great youth development. Teams like Manchester United and Spurs spent more on players but were not as good. In the early Wenger years, the likes of Newcastle and Liverpool spent more money, but again were not as good as Arsenal who had a great team as well as great individuals like Bergkamp, Pires and Henry. I loved the fact that we were hated and despised. They hated us because we were good. I loved the ticket prices. I say that with hindsight, because at the time affordable music gigs and sporting events were the norm. Charging lots of money just to watch a game of football was not seen as logical. Arsenal were the best value team in London and cheaper than Spurs and Chelsea. I still have my Dad’s ticket from that Everton game in 1986. It was £4.50 and that was for a good seat in the East Stand. If you wanted to stand on the terraces, a hard-up adult only needed a few pounds to go to the game and get a release from everyday troubles. 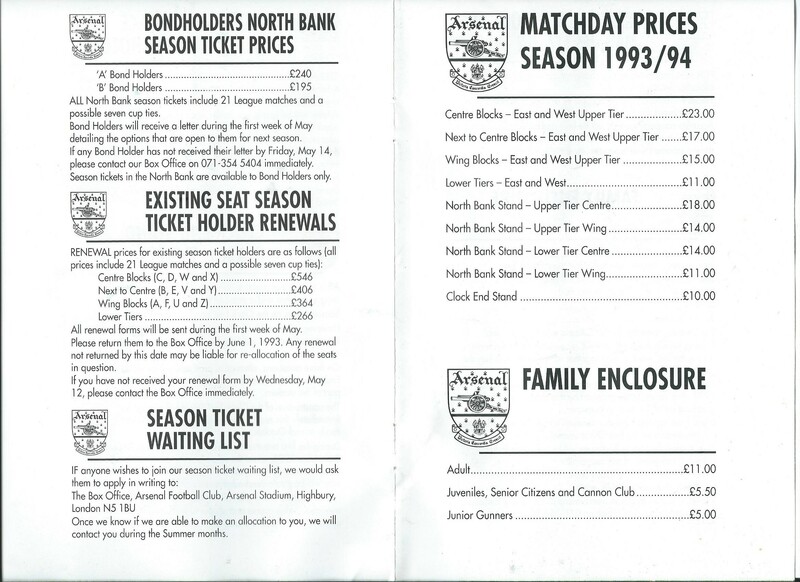 Even by 1995 you could get into the Clock End for £10. That’s why it’s so heartbreaking to see a club become expensive and exclusive – it simply doesn’t fit with the overall history and traditional fan base. I can’t love a club that prices out people in the manner in which they have. I can’t love a club which sues a small shoe shop in Spain because it’s called Arsenale. I can’t love a club of whose stadium is designed primarily to attract rich business. I can’t love a club whose current fan base don’t get behind the team and don’t have any remote interest in the overall history. I can’t love a club who changes their club branding from a regal crest to a cartoon cannon which looks to have been designed by Noddy and Big Ears. I can’t love a club who would rather make profit instead of breaking even and trying to win trophies. Most clubs now are the same, the problem is widespread and football like Arsenal – I would argue is impossible to love right now. The reason I shun the modern game is because I love it so much and know it can be so much better than the current culture of greed and control. This entry was posted in Arsenal and Me and tagged Arsenal, Arsenal FC, Everton, George Graham, John Lydon, Liverpool, Premier League, She Wore A Yellow Ribbon, Viv Anderson on August 15, 2013 by keenosafc. Similar story to mine, although a couple of years earlier. Stirred up memories that will never happen again, well written!